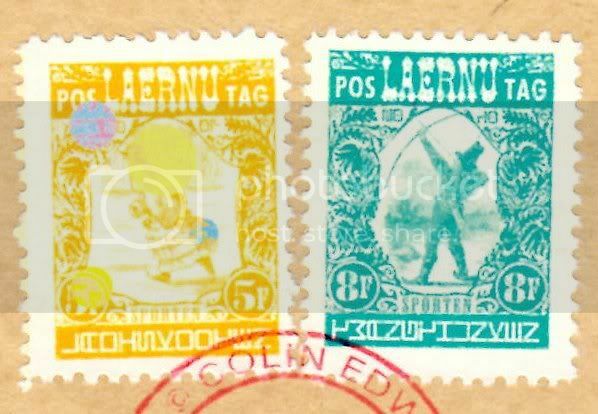 So who has what of the new Laernu Sportens on their post? 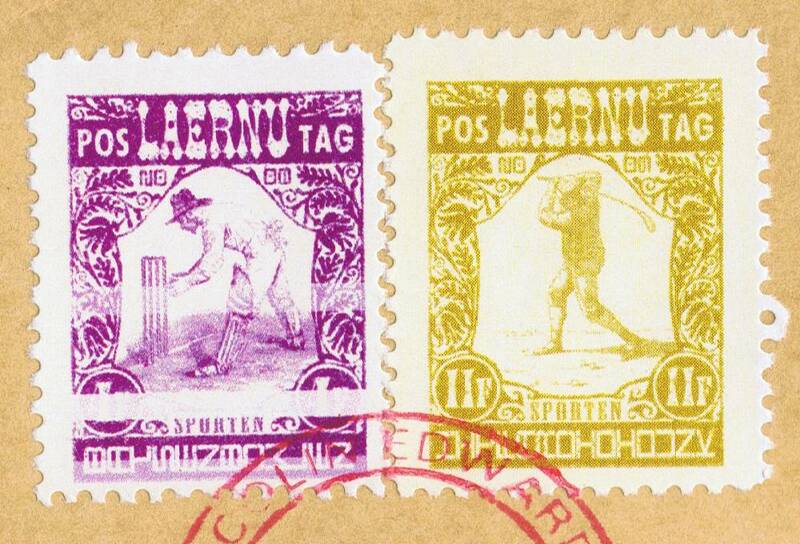 I have an 11F yellow-bistre which is clearly a golfer even though it has been misperfed so that the right is on the left of the stamp and the left on the right - with an imperforate margin down the middle. Oh and the Malthouse CDS covers some of the letters! I think it says HITFAROUTDUNK although that doesn't quite make sense and we might have to wait for one without bisected, franked, text! If anybody who got Jacks stamps and has no need for their Sportens there is a home for them here. I also got 2 (which Steve can't have ), a 2F purple featuring bowls, ROLLENROLLEN and a 4F green featuring cricket, BATSENBOWLEN. No obvious variations. I hope that Colin makes theses available to buy at some stage. I hope that Colin makes theses available to buy at some stage. So do I. The perfect antidote to the overblown blatent commercialism to 2012. Here are the ones I got on my envelope. Still not good on colour perception here but I would say that the one on the left is a purple 4F cricket BATSENBOWLEN (with two horizontal white tramlines) and the one on the right is a yellow 11F golf HITFARDIDIDUNK. Another vote here for Colin to issue these as he did with the previous eight sportens. My only small reservation/disappointment is that these values seem mostly to replicate those in the previous series and I would personally have preferred to see the value gaps filled in. The original set were the 1F, 2F, 3F, 4F, 5F, 7F, 9F and 11F. So, there could have been the 6F, 8F, 10F, 12F, 15F and 20F for example to create a single low value series of sportens and Colin could then have created slightly different format mid and high value series later. Thus far, we have reported new versions of four existing values (the 2F, 4F, 5F and 11F) plus a new 8F value. They are simply an update on the existing Sportens. The stamps feature sporting heroes and record their achievements so from time to time they are updated, but the values have so far remained the same.